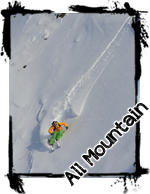 YMLI ALL MOUNTAIN – Generally speaking, this category combines the parameters of traditional downhill skis with the skis for the deep snow. Lower radius provide easy veering, side cut provides good edges loads and smooth carving curve. The versatility of this category allows the use skis in all mountain terrains.nů. 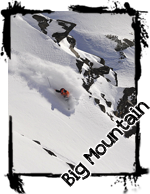 YMLI BACKCOUNTRY - freeride and freestyle, this heterogeneous category includes a wide range of skis, whose common characteristic is always markedly raised tail and relatively large width. Other differences are not so significant. It's about the different distribution of flexion and often shifted assembly point towards the tip of the ski. Other differences compared to other freeskiing skis are not so considerable. What does the skis should manage? Jumps (mainly drops!). Larger width gives them stability on landing in deep snow. Some of the skis in this category are mixed with BM skis. Most of them tend to be slightly stiffer. Length selection depends on terrain, experiences and the expected high of jumps. 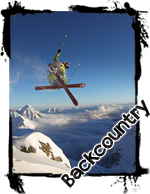 For the BackCountry tricks skis can be the same high as the rider, or slightly longer. Binding is often mounted near to the ski centre for easier control in rotations. YMLI BIG MOUNTAIN - Long turns. Fast runs. Drops from high cliffs. Straight line – chutes rode in high speed at no-fall zones. For these types of rides you need skis over 100 mm wide, longer than your height and with large radiuses. Side cut depends on personal preference and experiences. Higher length is necessary for stability and speed; you can add 10 cm to your height. Skis in this category usually don’t have twin tip on the tail, and thus allows to keep the upright position - so you don’t have load too much of tail and fight with its buoyancy. Park & Pipe - ski cathegory dedicated for specific treatment in parks and pipes. Twintip stiff ski absorb landing and urban jibs/rails all kinds. Thanks to full camber also ski also soften landing on backwards and provides stability while flex on the tip and tail brigh the feeling of lightness.